Earliest source for kesidran in tefillin and mezuzos? 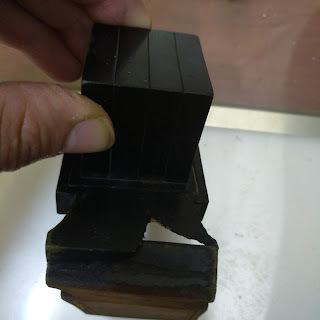 Does anyone know the earliest source(s) for the law of kesidran in tefillin and mezuzos? The Rosh in hilchos tefilin quotes Mechilta parshas bo [tanaic source]. Thank you. Is it clear that the Mechilta is referring not just to the physical placement of the letters, words and the parshiot relative to eachother, but especially to the point in time the letters, words and parshiot were written relative to eachother? Thanks. Was the Rosh the first to explain the mechilta this way- i.e. the letters, words and parshiot must be written in the temporal sequence that they appear in the Torah? No this law is quoted earlier than the Rosh, in Rambam. But the Rambam didn't mention any source. True the Mechilta is not clear, if speaking about seder of the parshiyos in the batim of rosh [or on the klaf in yad] or the seder of the writing. The Mechilta doesn't regard mezuza, only tefilin. The Rambam writes that the law c'sidran applies to mezuza as well. Rishonim [see Cesef Mishna H. Stam ch 1) quote Yerushalmy Megila as source of Rambam. Thanks. I looked in Rambam hilchos sta"m and I couldn't find where he mentions kesidran as we understand it today. Where do you see it? I only found that he says that the 2 mezuzah parshiot must be in the correct order on the klaf. כסף משנה שם: בירושלמי פ"ק דמגילה והטעם משום דהוי שלא כסדרן, ואמרינן במכילתא כו'. Thanks. I didn't catch that. I was only looking for the word "seder/sidur". This teaches that "kesidran" in writing applies within a word or parshah. Where do we learn that it also applies between one parshah and another? - I.e. Shema must be written before Vehaya im shamoa? See Cesef Mishna ibid that doesn't differentiate, between words or parshiyot. 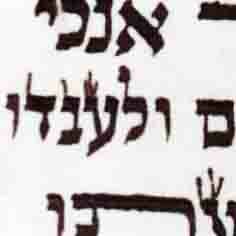 The simple neaning of the Michilta refers to the 4 parshiyos, while the Yerushalmi mentioned specifies letters or words. Thanks again. 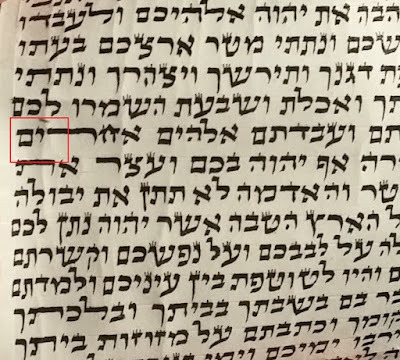 The first clear expression of "kesidran" as also applying to the timing of when each parshah was written relative to another parshah - does this first appear in the Rosh or in the Cesef Mishnah? The Kesef Mishnah tends to interpret the Rambam in light of other Rishonim. In fact, it is not at all clear that the Rambam himself holds that "kesidran" applies to the sequence of writing each letter. See חדושי מרן רי"ז הלוי. Rav Kapach (in his commentary to Mishneh Torah) agrees with Kesef Mishneh, but (לענ"ד and not that he needs my haskama) the Brisker Rav's analysis is convincing. Thanks. In Rambam hilchos stam 1:16 it says for tefillin and mezuzot if one letter was forgotten then one can't go back and write it but must be gonez it. If there was a tikun then why must he be gonez? Which parts of the Kesef Mishneh does Rav Kapach agree with? What does the Brisker Rav conclude? After rereading the Rambam hilchos stam, especially the halacha I cited before (1:16), I agree with you now that it is not at all clear that the Rambam holds of this at all. 1:16 is speaking about "hanging" the letters and not about erasing and correcting. Thanks. I'm beginning to suspect that there is no clear source older than the Rosh for sh'lo kesidran exactly as we hold today that every letter must be written in sequence, not just within a parshah but also between parshiot.